Hobos To Street People: Artist’s Responses to Homelessness from the New Deal to the Present, is a traveling exhibition now showing at the California Historical Society in San Francisco, California. Consisting of 75 artworks on the subject of homelessness from more than 30 national artists who span the decades, the timely exhibit concentrates on parallels between today’s works of art expressing social concern, and similar works created during the Great Depression. More than a few of the Depression-era artists whose works are included in the exhibit have regrettably fallen into obscurity, and so I would like to focus special attention upon some of them. One such artist is Jacob Burck (1904-1982), whose lithograph The Lord Provides is one of the more sardonic artworks in the exhibit. A painter who became well known for his editorial cartoons published in The New Masses and the Daily Worker during the 30s, Burck received a Pulitzer Prize for Editorial Cartooning in 1941 for his poignant, If I Should Die Before I Wake; a depiction of a forlorn child in the ruins of the Second World War. The Lord Provides depicts what was a common occurrence during the depression, the arrest of those who protested for jobs, state relief, and the cessation of forced evictions. The title of the print was a jab at the fundamentalist Christian preachers of the day who sermonized against government intervention on behalf of the poor. The Lord Provides - Jacob Burck. Lithograph. 1934. Courtesy of M. Lee Stone Fine Prints. 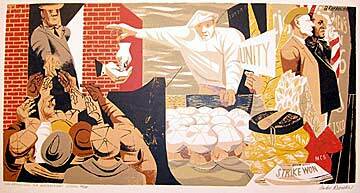 Aesthetically speaking, one could imagine Albert Potter’s 1933 woodcut, Brother Can You Spare A Dime, being created just this month. Potter (1903-1937), lived and worked in New York’s Lower East Side, where he made numerous sketches and prints based upon his observations of urban life. He joined the WPA Federal Art Project in 1936, but his life was cut short a year later when he fell from a rock face while making sketches on a field trip. Potter’s stark black and white portrayal of the grim reaper looming over a shattered metropolis populated by unemployed workers seems extraordinarily pertinent, especially when thinking of a devastated U.S. city like Detroit. Included in Hobos To Street People is the serigraphic print, San Francisco 1934 Waterfront Strike, by Anton Refregier (1905-1979). One of the greatest social realist artists to have worked in America during the 1930s, Refregier emigrated from Russia to the U.S. in 1920. He studied at the Rhode Island School of Design until 1925, and joined the WPA Federal Arts Project (FAP) in 1934 as a muralist, teacher, and supervisor of mural projects. Refregier was selected by FAP in 1941 to design and paint a twenty-seven-panel mural for the Rincon Annex Post Office in San Francisco, California. The agreed upon subject and title for the mural series was The History of San Francisco. Refregier was paid $26,000 for the monumental project, which at the time was the most expensive public art commission in the nation. The mural series covered 400 square feet and took eight years to finish. 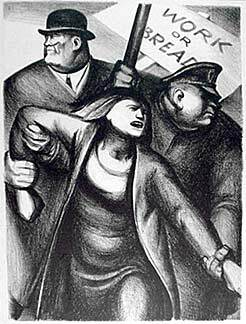 San Francisco ‘34 Waterfront Strike - Anton Refregier. Screen print. 1949. Courtesy of M. Lee Stone Fine Prints. Almost from the onset, Refregier’s murals were controversial. Instead of a pleasing tableau based on mythic ideals, the artist expressed the truth about the state’s actual history. 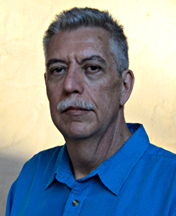 He depicted the original Native American inhabitants and their displacement by the 1849 California gold rush; the construction of the Union Pacific Railroad by immigrant Chinese workers and the racist anti-Chinese 1877 “Sandlot” riots – as well as the 1916 frame-up of Socialist union organizer Tom Mooney. Refregier also included in his mural series a depiction of the 1934 San Francisco Waterfront Strike, where Longshoremen triggered a general strike that completely shut down the city, leading to the unionization of all West Cost ports of the U.S. After the mural series was completed Refregier created a silkscreen print version of his ’34 Waterfront Strike mural panel – the same print on display in the Hobos To Street People exhibit. “In this middle period of the 20th century, we are faced with the dilemma of reconciling the profit motive and the cultural needs of the American people. There is no denying that the capitalist system has provided material abundance unknown in previous history. It has been less successful, however, in implicating the spiritual values which would make that abundance meaningful in terms of human satisfaction. The unease and alienation that Refregier spoke of has grown exponentially since his death, as the mass produced culture offered by capitalism reaches stunning new heights of mediocrity and vapidness. As a new depression looms over the U.S. and millions of Americans loose their jobs and homes, all while the Obama administration fights wars in Afghanistan, Pakistan, and Iraq - it will be exceedingly difficult for creative professionals to go on pretending that all is well. Sooner rather than later, a new school of socially engaged art will indeed emerge and flourish in the U.S. Hobos To Street People is unquestionably a contribution to such a burgeoning art movement. At the time of this writing the exhibit is currently showing at the California Historical Society on 678 Mission Street in San Francisco, CA. (phone: 415-357-1848). Entry fees have been waived so that one and all can see the exhibit for free. A website for the exhibit can be viewed at the Western Regional Advocacy Project. In months to come the exhibit is scheduled to be shown at the following venues: Kolligan Library - University of California, Merced, CA (Aug.- Oct. 2009), Corona Public Library - Corona, CA (Nov. - Jan. 2010), Hayward Area Historical Society - Hayward, CA (March - May 2011), de Saisset Museum, Santa Clara University - Santa Clara, CA (July - Sept. 2011).